The leader of Broxtowe Borough Council has welcomed additional peak time capacity and improvements to trains and stations that will be introduced following the new franchise agreement for the East Midlands Railway. Councillor Richard Jackson, council leader, has welcomed news that Abellio has been successful in its bid to operate the East Midlands Railway franchise, with a commitment to increase the number of trains and capacity on each train at peak hours and weekends, as well as investing heavily in station improvements. 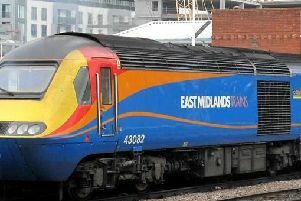 Passengers in Nottinghamshire will see significantly reduced journey times and an increase in the number of services on this route, as well as enhancements to East Midlands Parkway with an with an improved café and waiting area and also to Nottingham station which will include better weather-proofing, retail brands and customer areas. There will be extra peak hour capacity across the line, with passengers benefiting from an 80 per cent increase in the number of morning peak seats into and out of Nottingham, Lincoln and London St Pancras every day. There will also be 2,437 more seats on trains going into Nottingham every day, an increase of 46 per cent. Coun Jackson said: “Today’s announcement is great news for local people in Nottinghamshire who rely on our trains every day to get to work, to visit friends and family, and to travel. “We are committed to improving connectivity across the country and are investing heavily to increase the number of rail services provided and reduce the time it takes passengers to reach their destination.